Why Trump Is Here To Stay — At Least For A While : It's All Politics Who is the Trump coalition? Working-class white men and core Republicans find his straightforward style and nonpolitician approach refreshing. That means he could have staying power in this race. 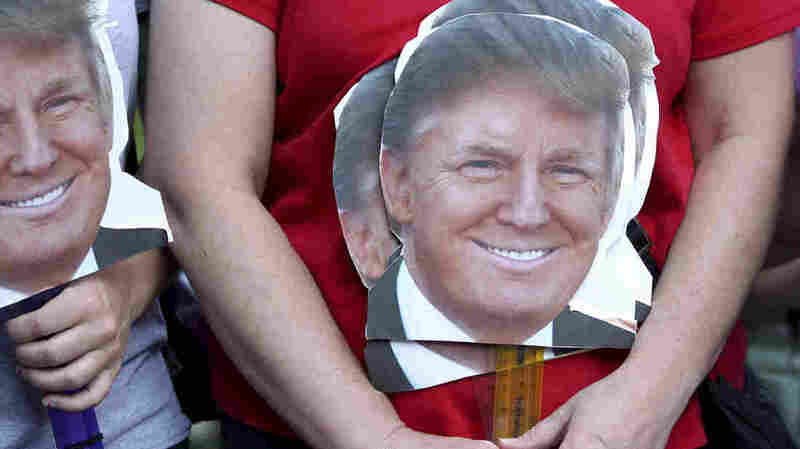 A woman holds signs depicting the head of Republican presidential candidate and businessman Donald Trump as she waits to enter the auditorium to hear him speak on Wednesday in Derry, N.H.
Donald Trump's summer of defying political gravity is continuing, despite predictions that various missteps would damage him. Instead, he has surged even more after his controversial Fox News debate performance. But who exactly are the people backing the boisterous billionaire businessman? Some recent polls offer a glimpse into the Trump coalition, which may run strong within a certain section of the GOP but faces many hurdles when it comes to a general election. Trump's base may be working-class white men, who find Trump's straightforward style and nonpolitician approach refreshing, according to recent surveys and focus groups. In last month's NBC News-Wall Street Journal poll, Trump did well among nearly every subset of the Republican Party. He registered highest with voters without a college degree. He also performed strongly among men. They viewed him very positively. He was most well-liked by Tea Party supporters and those who regularly listen to conservative talk radio. "The groups that he's doing well with are very often the core of the Republican Party's primary electorate, which is why he's not taking much incoming attacks from his fellow competitors," said Lee Miringoff, director of Marist University's polling operation, which conducts state-based surveys for NBC News. Because of that, Miringoff said, don't expect Trump to fade anytime soon. "Those who thought this was a summer romance that would vanish when school returns are probably mistaken," he said. "This is very real. He's tapped into a lot of sentiment about the anger and frustration that people have, which is not new. But he's seen as a straight shooter, and he doesn't hold his punches. That seems to resonate with a lot of people." Lanae Erickson Hatalsky, director of social policy and politics at Third Way, said she saw that dynamic on full display in recent focus groups the centrist Washington think tank conducted among swing and independent voters. "The only presidential candidate whose name crossed their lips has been Donald Trump," Hatalsky said. "The level of vitriol toward money and politics seems to be at a fevered pitch among every swing subset. All of them seem to think that Donald Trump is an answer to getting money out of politics. They thought he can't be bought." Their focus groups in Northern Virginia, Las Vegas, Milwaukee and Des Moines, Iowa, were separated by gender and included mostly white, middle-class swing voters. Hatalsky said it was evident the men were much more fervent in liking Trump, saying they, too, believed that being too politically correct was a major problem in the U.S.
"It's not just that he says whatever he wants, which is refreshing to them," Hatalsky said. "He's parroting that problem for them and saying aloud the diagnosis. Independent men really talked about a sense of being almost muzzled in lots of areas of their life. It was cathartic for them being able to watch Trump speak his mind about whatever he wants." Seventy-two-year-old Franklyn Patrick Farnham came from nearby Massachusetts to attend a town hall Trump held in New Hampshire on Wednesday night, even though he can't vote in the first-in-the-nation primary. He told NPR's Asma Khalid he's excited about a Trump bid because he's "guileless." "I'm totally behind Donald Trump because he's not a politician," Farnham said. He's not a Washington bureaucrat; he doesn't come out of Obama's sneaky White House. He's clean, and he's free. He doesn't need this; he's one of the wealthiest men in the country, but he sees what's going on in the country and he wants to save it." Elena Abbene, a conservative Tea Party voter from Bedford, N.H., told NPR's Khalid it's that gusto that has her leaning toward Trump. "He's not afraid to say what everybody's feeling and afraid to say," Abbene said. "He doesn't have a filter." But while Trump may be peaking in those areas among Republicans, he may have a much harder time continuing that appeal in a general election — if he were to get that far. Trump has the highest unfavorable ratings of any 2016 candidate, Democrat or Republican. While he performs best among white men and white, working-class voters, he has high negatives with minority voters. And even among white men, he has a 13-point net-negative rating; among the white working class, he's a 4-point net-negative. Compare that to black voters, who rate him 60 percentage points more negatively than positively, and Hispanics, who give him an even worse 62-point net-negative rating. Trump also performs poorly among voters who have a postgraduate degree. He does best with voters who finished high school or less. Miringoff agreed that while the general election trend may be troubling for Trump, he still has the edge in the GOP primary — and that may not be fading anytime soon. Meanwhile, Trump will continue to campaign in his trademark unorthodox style that still befuddles many political observers. "Take the campaign consultant book out and shred it," Miringoff said. "He's doing very little by the rules by the way of campaign strategy."